Alcatel, HP, and others will now carry the Windows Phone torch. Remember when Microsoft touted Windows Mobile during earnings calls? Now, Microsoft's Windows Phone business is "immaterial," while Office, Azure, and other cloud and services products continue to propel the company to profitability. In a small note during its second-quarter earnings report Thursday, Microsoft said its phone business had declined $361 million in revenue from a year ago, leading to the claim that the phone business was “immaterial,” or not enough to report to investors. It wasn't enough that Microsoft’s More Personal Computing segment reported a revenue decline of 2 percent to $8.8 billion: chief financial officer Amy Hood also noted that phones caused a four-percent decline—in other words, Microsoft blamed phones for the company’s loss. Meanwhile, Microsoft’s mantra of “mobile first, cloud first” has been officially discarded. Chief executive Satya Nadella said the company's new message of “intelligent cloud and intelligent edge” is resonating with customers everywhere. Given that profits more than doubled to $6.5 billion on 13 percent revenue growth to $23.5 billion, that appears to be true. The story behind the story: Microsoft is following the growth, and it's not in Windows Phones. In 2004, Microsoft’s phone business topped 15 percent, ahead of every operating system not named Symbian. Since then, it's steadily declined. That Microsoft’s phone business was dying has been evident for ages; publications like Wired wrote off Windows Mobile (now just Windows 10 for phones) way back in 2009. Phones like Microsoft’s own Lumia 950 aren’t even sold on Microsoft’s site anymore. In fact, the only Windows phone to appear on Microsoft’s online Store page when you type in “phones that run windows 10” is the Alcatel Idol 4S. HP’s Elite x3, the powerful business phone that runs Windows 10, is now priced to move: at $499, down from $799. 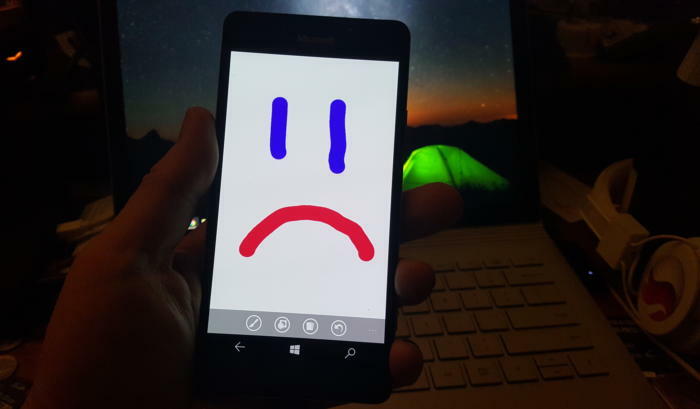 The Windows phones still clinging to life are not Microsoft's. HP and Alcatel keep on keeping on. Microsoft patches existing features without planning new ones. Meanwhile, the company continues to count Android and iOS phones—90 million of them, Microsoft said—that use Office on a monthly basis. Our prediction of eighteen months ago appears to be coming true.